Come behind the scenes at Felted Button for a #KnittingNookTour and see Susan's headquarters in Sandy. I find the colorful chaos of my space stimulates my inspiration, as long as it stays a bit organized! Often, all it takes is a little rummaging through yarn bins, lining up balls of yarn across the floor, and grabbing my hook to really get me busy creating. My least favorite part of my space is actually my computer--because the work I do there is my least favorite--pattern writing, tech editing and answering email. To help with this--I add lots of colorful bits and bobs around, like a crocheted mouse pad to make it feel less like drudgery and more like creative play. 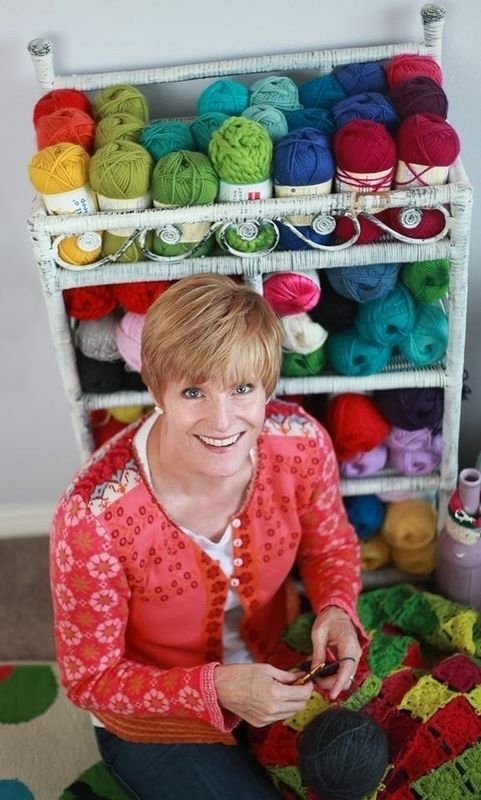 Although I have a studio space which is dedicated to Felted Button, I often find myself crocheting in my comfy orange chair with my rolling cart of yarn and hooks next to it in the family room , where I can keep in touch with my family or binge "watch" Netflix. I've got a bit of flexibility with where I work, and that's a fortunate thing! I have my space in a state of organized chaos with lots of color and plenty of containers. I have self-proclaimed "compulsive containerism" where I find myself collecting containers before I have anything to put in them. But it doesn't take me long to fill them up with notions, balls of yarn, buttons or individual yarny projects in various stages of completion. How do you keep your projects, yarn and supplies organized? Don't look too hard at the overflowing yarn cubbies or into the many yarn-stuffed bins, because you might discover that I'm a yarn-hoarder. And then there are the many colorful ends that get put in little tins, colorful jars, or vintage glass vases. I also keep each project in its own bin, basket or bag--with hook, yarn, and wee scissors together. This makes crochet-on-the-go much easier. As I often say, "Have yarn, will travel." Any tips & tricks for staying organising and untangled? Did I say I have "compulsive containerism"? Containers, containers, containers, in all shapes and sizes. I prefer colorful glass jars, vintage tins, industrial metal baskets and large fabric bins that fit nicely in cubbies (for my yarn). I've even got a colorful hanging shoe caddy for my yarn cones. I have two large baskets full to the brim with leftover yarn scraps that I wind into small balls and clip with a mini hair claw--very handy. A place for everything, everything in its place is a brilliant motto, and I believe in it. I have lots of crochet items around my home from blankets and cushions to rugs and table runners. But my favorite creations I've made are the random things--like my felted birds, felted house, buntings, amigurumi animals, and even my rainbow meterstick sleeve. My favorite crocheted thing might be the rather hideous granny square vest that my grandmother made. It's not pretty, or stylish, or elegant, but she made it. Being that she is the person who taught me to crochet, it means a lot. Sentimental, I am. Organzing my ideas has been an uphill climb. I've tried all kinds of journals, memo books, notebooks--even a small box. This year I'm giving a small, colorful binder with movable pages a go so that I can continue to reorganize by adding or removing pages while certain ideas explode and others die off. So far, it's given me the flexibility I need to keep things in one place, discard abandoned ideas, and control my meandering brain. If only the inspiration would wait to strike until I've got the binder with me! Inspiration comes from everywhere--displays in a store, vintage items at my local thrift store, quilts, coloring books, tiles, vintage china, photography, nature, graphic art, etc. Regardless of the source, my greatest inspiration is always color. Color makes my heart happy. If you had three wishes, what would you do to make it your dream stitching space? 2. Yarn fairies to untangle my yarn!